You’re midway through a major fundraising campaign, and it’s time to take stock. Are you still on track to reach your goals? What course corrections do you need to make to your campaign plan? And what does a path to success really look like at this stage? Chances are, you started out with a solid plan at the beginning of the campaign. You invested time and resources to gauge stakeholder interest and develop a document to guide you through the unknown ahead. But halfway through, circumstances may have changed, and staff are often looking at the all-important campaign plan less and less. It’s time to refresh your strategy so it remains relevant. Everyone who’s ever been through a fundraising campaign knows that you can’t drop everything and launch into a long, involved assessment at the midway point. You’re making a critical shift from focusing on leadership and major gifts to engaging your full audience: Any assessment needs to be quick and cost-effective, providing easy-to-follow, tactical recommendations. Enter the mid-campaign analysis: a streamlined, data-driven dive into campaign progress to date. This one-month process looks at campaign programs and giving levels, slicing and dicing your data to uncover your greatest strengths and biggest areas of opportunity. 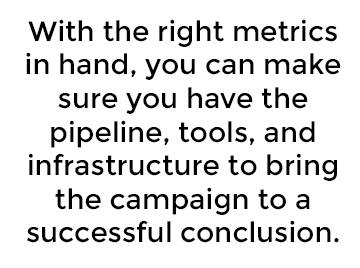 With the right metrics in hand, you can make sure you have the pipeline, tools, and infrastructure to bring the campaign to a successful conclusion. Analyzing campaign progress to date. Focus on how the campaign has performed against the goal overall, at every giving level, and for every component project. Doing so will provide you with a complete picture of your campaign outlook at this moment and reveal areas that need extra focus or a strategy adjustment. Gathering input from staff. Survey your staff members to understand how fundraising is progressing and what changes to systems or staff expectations would be most useful. Surveying is a fast way to gather feedback from those closest to the campaign while giving staff a chance to voice concerns and take an active role in the mid-campaign analysis. Updating portfolios. Review how effectively your fundraisers have been able to move through their portfolios and identify any necessary adjustments. Making tweaks to portfolios to achieve the optimal balance will ensure your gift officers are focusing their attention on the right mix of prospects. Charting multiple paths to success. Finally, outline the campaign pipeline and revenue scenarios for the remainder of the campaign. You can assess the impact of proceeding as planned, increasing giving at specific levels, upping the overall goal, or increasing the number of solicitations per month. With this analysis organized in a user-friendly document (we like to call it the “mid-campaign snapshot”), you’ll have the information you need to make decisions, have crucial conversations with the board, and pivot as you work to the campaign’s conclusion. Are you ready to launch your own mid-campaign analysis? Contact me to learn more about how Campbell & Company can partner with you to assess your progress and prep you for the final stretch. Carrie Dahlquist is Director of Strategic Information Services at Campbell & Company. Carrie’s areas of expertise include Advanced Analytics, Benchmarking, Campaign Management, and Strategic Planning.